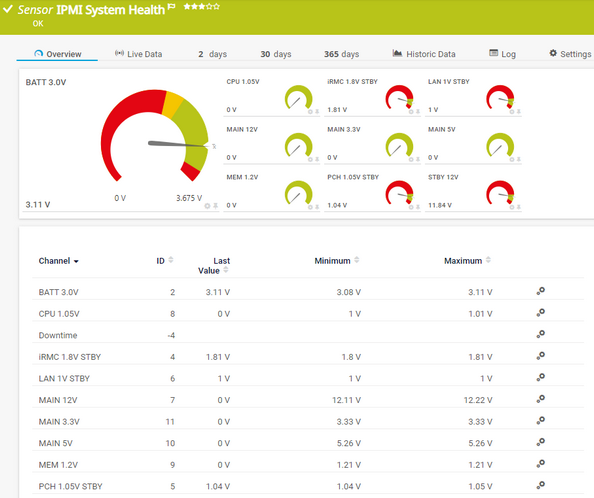 The IPMI System Health sensor monitors the status of a system via the Intelligent Platform Management Interface (IPMI). Temperatures of, for example, the system or the peripheral temperature. You have to explicitly specify the credentials of the IPMI in the sensor settings. This sensor type has predefined limits for several metrics. You can change these limits individually in the channel settings. For detailed information about channel limits, see section Sensor Channel Settings. Before you can actually add this sensor, PRTG will ask you to provide your credentials for the Intelligent Platform Management Interface (IPMI) in the Add Sensor dialog. Enter the Username and the Password in the respective fields. Select the metrics you want to monitor. PRTG will create one sensor for each metric you choose in the Add Sensor dialog. The settings you choose will be valid for all sensors that you create when you finish this dialog. Enter the username for the Intelligent Platform Management Interface (IPMI). If not changed yet, this field shows the username that you defined during sensor creation. Enter the password for the Intelligent Platform Management Interface (IPMI). If not changed yet, this field shows the encrypted password that you defined during sensor creation. Shows the metric that this sensor monitors. Once a sensor is created, you cannot change this value. It is shown for reference purposes only. If you need to change this, please add the sensor anew.